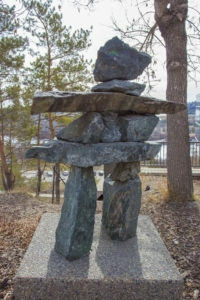 Inukshuk was created in memory of the heroism of 14-year-old David Kootook who was aboard a plane that crashed in the Northwest Territories about 300 km north of Yellowknife. Kootook initially survived the November 1972 crash that killed two other passengers. Despite suffering from appendicitis, David kept the surviving (but injured) pilot, Martin Hartwell, alive for 23 days before finally perishing himself. Hartwell was rescued eight days later. An interesting connection is that Hartwell was eventually commemorated in Stompin’ Tom Connors’ “The Martin Hartwell Story”. Biography: Wayne MacKenzie’s formal art education began in painting classes at the Edmonton Art Gallery in 1962. He eventually studied painting at the University of Alberta and metals at the Alberta College of Art. He has since taught jewellery courses at the A.C. Leighton Centre, Alberta College of Art, Red Deer College “Series”, North Island College (Metal Jewelery Design Certificate and Metal Jewelry Arts Summer Session), and held workshops across Alberta. He received the ACAD Alumni Award of Excellence in 2002, and in 2005 was commissioned to build the prestigious Lieutenant Governor of Alberta Arts Award medallions. His professional career has centred on custom jewelry. His interest in the style of early Greeks and Romans, ancient Aztecs, contemporary Europeans, and the Alberta landscape is juxtaposed with the concepts of spacial relationships, textural statements, colour contrasts, accenting lines, and gemstones. His work focuses on simplicity and strength of line and shape. MacKenzie’s studio is currently located in Courtenay, B.C.